Teaching is the definition of a labor of love. 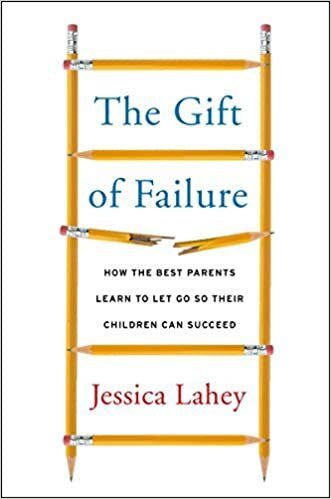 Low pay, over-emphasis on tests, long (and often unpaid) hours, and questionable district/state/federal mandates can drive many teachers to a place of negativity. However, we must make sure we are making profound efforts to rise above this. As I mentioned in my previous post, I want this year to be different. 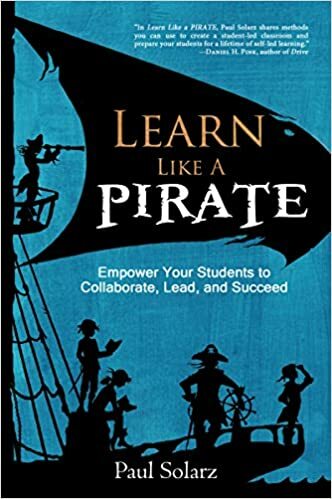 I want it to be different for the students, but I also want it to be different for my colleagues and me. Last year, we were told we were in danger of losing accreditation. This took a large toll on all parties involved, and morale was way down. I would joke last year that I loved my job from 8-3, but hated it outside of those hours. There was certainly an element of truth to that, but I don't want to do that again this year. 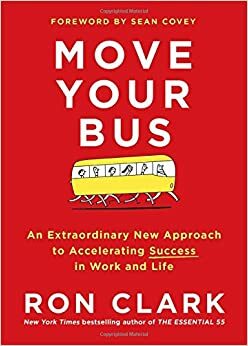 Our class motto is "We don't make excuses, we make changes." We say it every morning to close our morning meeting. I would be a hypocrite if I didn't live it myself. 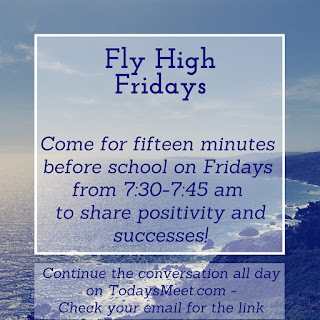 In talking with my friend and EduRoadTrip podcast co-host, Mari Venturino, we developed the concept of Fly High Friday. 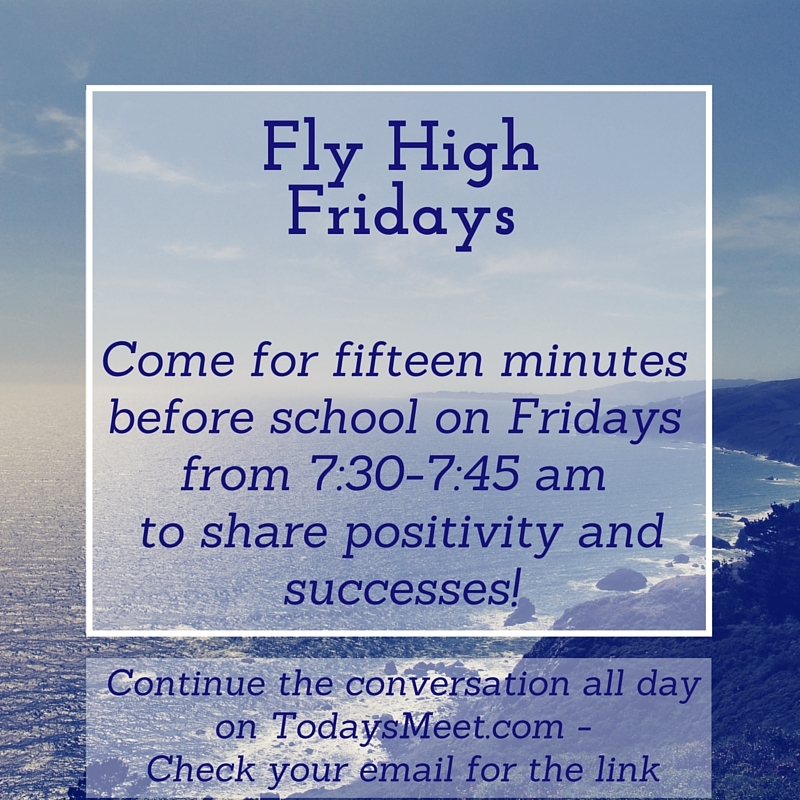 What is Fly High Friday? The vision was to bring together the staffs of our schools to celebrate success and positivity from our week. This would be an optional event so it wasn't forced and fake. I partnered with my school counselor on it and we sent out the email inviting all to come. We decided to meet before school on a Friday for fifteen minutes. The first week went really well and I was happy we were off to a good start. Each week, we have had fluctuating amounts of people, but seem to have a strong core group. We have a website set up for those who can't make it to the morning session and have a TodaysMeet chat room set up so the conversation can last all day. It is very refreshing to start off my final day of the week on a positive note. I get to hear great things that other teachers are doing and can share my students' successes in my own room. 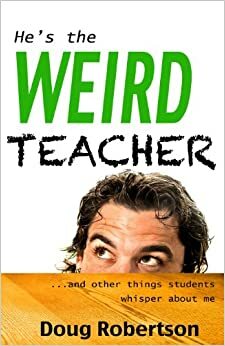 Other teachers reflect the same feelings. It's amazing what a shift in mindset can do. You can join in the sharing too! On Fridays, tweet out your own positive messages about your week using #flyhighfri. 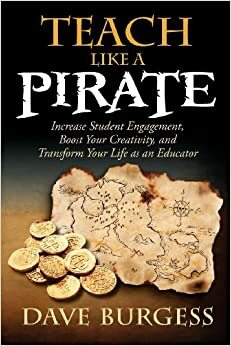 I would encourage you to start a face-to-face meeting in your own school as well! Pick a day that works for you: Mindfulness Monday, Thinking Positive Thursday, or anything else you can think of. Let's end our weeks strong and on a high note!